For decades, William Hill has been the biggest name in sports betting, with betting shops on every British street corner. It should come as no surprise then that over the last few years, William Hill Online has become its own force to be reckoned with. The online gaming site is hugely popular, and it’s easy to see why. With a huge variety of games, odds, and bonuses and promotions, it’s plain to see that William Hill provides a betting experience that is not to be missed, for customers in Canada as well as around the world. Everyone’s favourite, a 100% matched deposit bonus on your very first deposit. This is worth up to $100, so you won’t want to miss it. It is a perfect way to begin a betting at one of the world’s top sportsbooks, William Hill! New Poker players can double first deposits to William Hill Poker, up to a maximum of $2000, when they sign up to the site and make that initial deposit. Likewise, folks who enjoy playing casino games can reap the benefits of making a first deposit, up to $1000. Of course, all the bonuses have terms and conditions, but to try out a world class betting site, these are amazing and useful offers. Which sports do William Hill have on offer? We could stand here all day reading the impressive list, which covers just about every sport most bettors are interested in. From the basics like horse racing, soccer, basketball and football, to less talked about but no less important games such as MMA and handball, William Hill Sports has probably got you taken care of. We recommend checking out the full list to get a better idea of the breadth of William Hill’s betting expertise. This is not a company who takes their sports lightly. A betting website is never complete without the classics, and William Hill is no exception. As touched on earlier, the poker and casino areas of the site are chock-full of exciting games, such as the popular European Roulette, Plenty O’Fortune, and Monty Python’s Spamalot casino games, and Twister Poker and Gladiator poker games. There is always a tourney ready to start, and the site has a truly impressive selections of casino games, including slots, jackpots and even scratch cards. If you like slots, make sure to check out the fun Avengers line of games, which feature everyone’s favourite superheroes, including Iron-Man, Captain America, and Thor. William Hill seems to be making sure that paying for your bet is as easy as placing it, which is of course of vital importance. There are many deposit methods available, including credit cards, debit cards, PayPal, EntroPay, CashDirect , Ukash, Skrill, Neteller, Paysafecard, INSTADEBIT, bank transfers, by personal cheque, and more. Most of the above methods of payment can also be used for withdrawing your winnings from William Hill Sports. Withdrawals are fairly speedy. William Hill boasts an excellent Customer Service team that is available 24/7 by phone, chat, mail and email. Replies tend to be speedy and helpful, something that should not be taken for granted in today’s world of automation and quantity over quality. Chat is available. When using the site, click ‘Help’ on the upper-right corner, and within the pop-up box, click ‘Live Chat’. All in all, there is no doubt in our minds that anyone looking to place a bet will find plenty of great options at William Hill Sports. 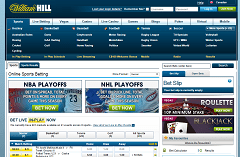 Whether you are a regular bettor, or just looking for quick odds before the big race or game, make sure to check out William Hill.